After a two-month hiatus, Tarik Abdullah's popular brunch pop-up, Morning Star, is back. Abudullah, a chef and culinary educator, ended Morning Star's successful six-month run at the Central District's Bannister in April. This Sunday, June 26, he's bringing Morning Star to Columbia City's Royal Room. Service runs from 10 a.m. to 2 p.m.
Abdullah’s flavors have always bold and wide-ranging, heavily influenced by North African and Middle Eastern cuisine, but also drawing from South Asia and the Mediterranean. (His last restaurant gig was cooking Mediterranean fare in the wood-fired oven of Eastlake's Cicchetti.) This weekend's menu includes (gluten-free) vanilla bean pancakes with apricot jam and coriander syrup, spiced lamb hash with yams and chickpeas over soft polenta, roasted cauliflower and millet salad, and a special of harissa-marinated jackfruit with roasted red peppers and red and black rice. Abdullah has kept busy during Morning Star's break. Last week, I spotted him helping out in the kitchen at Food & Sh*t, the monthly Filipino pop-up held at Kraken Congee. He's also working to transform the former Hillman City club Maxim's into the Black & Tan Hall, a community-oriented arts and restaurant venue that will also be a worker-owned cooperative. 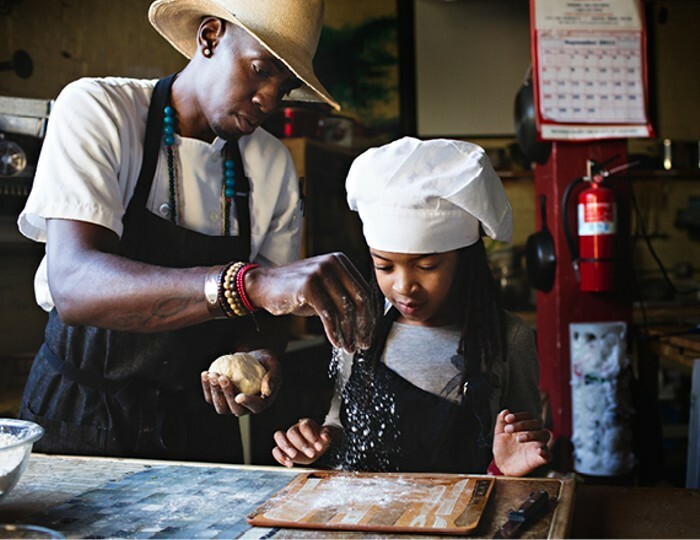 In July, he'll teach another round of his children's cooking classes at Hillman City Collaboratory. Which leads me to another reason why should head to the Royal Room on Sunday. Food aside, the vibe at Morning Star is what makes it truly great. The music is always what you want to be listening to, and the crowd—lots of black, brown, and white folks—is diverse and joyful. There's always a lot of love and gratitude in the air. It's Pride weekend, and while the Royal Room isn't close to downtown's big parade or the weekend's ongoing revelry on Capitol Hill, the spirit of inclusion and celebration (and, likely, lots of QTPOC) will be going strong at Morning Star. "Food, kids, and community. Those are my things," Abdullah told me last year. "That's what's important to me." Abdullah says this week's pop-up will be a "test run," but that he hopes to have a regular schedule figured out soon. Stay tuned.